We all have memories; more of them then we can ever recall. That is why diaries and pictures have been a part of many peoples lives for years. I've been obsessed with taking pictures for as long as I can remember, and I can't think of a better way to preserve memories. Several years ago I discovered scrapbooking, blogging (a public diary) and tweeting; that changed everything! Now I do it all. Finding ways to hold on to memories is so important to me. If you don't capture the moment while you can, you may never have a second chance to do so and nothing is more heartbreaking then forgetting those precious, long lost friends and the memories you made with them. That is until you get married and have kids. All of a sudden holding onto to your baby's little milestones becomes far more important than anything else. This incredible journey happened for me in December 2004 and again in May 2008. That is why I am such a big supporter of social media. I get to share with my family--and the world--what my kids are doing on a daily basis. I am horrible about grabbing my sons' baby books and writing everyday moments down, so I find on-line media to be the perfect way to record such information. Tweeting is especially simple since I can ‘tweet’ from my phone, which is always with me and only takes a minute. After I tweet, I can then go back and create blog posts from what went on during the day. I started a livejournal account before I got pregnant. I really enjoyed documenting life, so I talked my husband into helping me set up a blog on our surname domain. 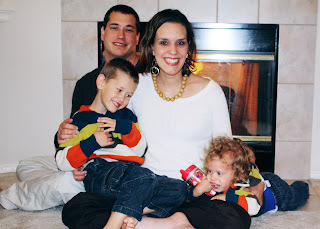 I blogged there until recently, when we launched http://www.wheelchairmommy.com/. The site includes an in progress FAQs, that I am sure many women and men in chairs get on a regular basis. It may sound strange to some people, but part of the excitement of having a blog is knowing that other people are sharing in the joy of seeing what prompts me to write. I love to be able to share my life with others and demonstrate what it is like to be a “wheelchair mommy.” Those who visit my blog learn that I have a spinal cord injury at levels L1-2, and they can read about my everyday life, including how I achieve everyday tasks from my chair. My blog allows me to inspire other people to get out there and try to do what they want to do or used to do. I'm never worried about what others are thinking when they see me out with my boys. I know from experience when I make a new friend they are amazed at what all I can do. I also own the domain at http://www.parentsonwheels.com/. I bought it when my first son was only a couple of months old and I met another mom in a wheelchair. The site still sits with nothing on it. Unfortunately, I have no idea what to do with it. Maybe parentsonwheels.com can be a resource for other sites such as http://www.mobilewomen.org/ , or perhaps a place for other wheeling bloggers to share their links so we can follow each other? I originally intended for the website to provide help and ideas for other parents, but everything just came naturally and I didn't know how to describe any of it. My dilemma with Parents on Wheels is a large part of how The Wheelchair Mommy was born. I realized that I don't really do or have any special equipment. I've often been asked how I do something or if I can help others do something, but when I try to explain, it's really not that easy. I just do it. I get my kids in the car the same way any other mom does. I just have to reach further. However, my balance isn't always great. When I'm maneuvering my son, I need to make sure my breaks are locked and lean on things when I reach my maximum trunk control. I cook the same way, I just have to do guesswork at times. I shop the same way, too. I put the baby in the cart, or let him sit in my lap, and push the cart with one hand, while rolling with the other. I'm really just as average as the next mommy; just in a wheelchair. Thus, The Wheelchair Mommy.